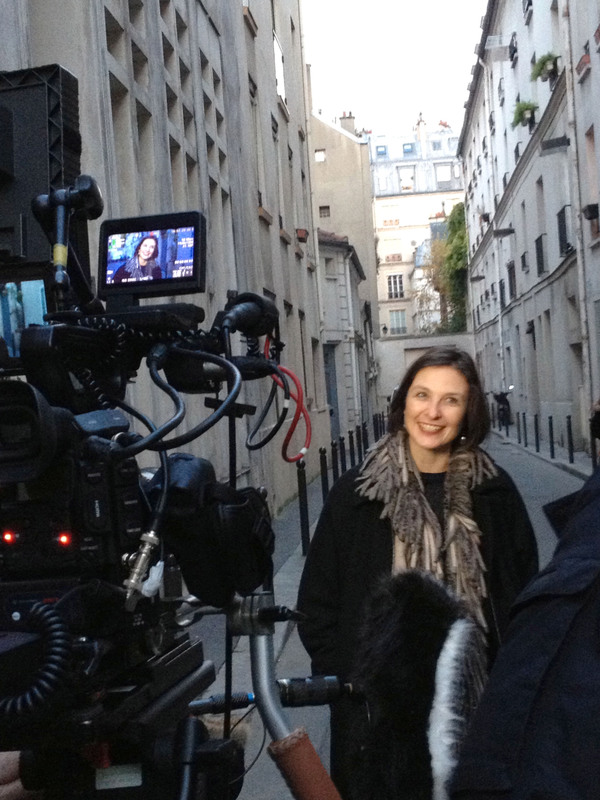 Eons ago, Leopard Films documented the story of my search for a place in Paris, a search which began after my mother died from breast cancer. The episode is finally airing on HGTV this Thursday, August 7th. 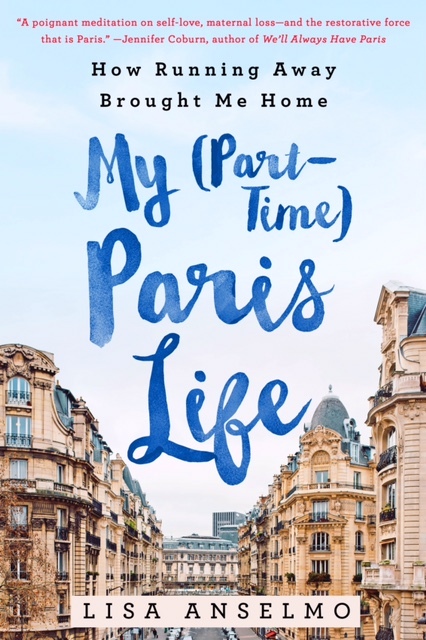 You’ll see what it’s like to hunt for a tiny slice of heaven in the City of Light, and get a tour of my Paris place. Don’t miss it! 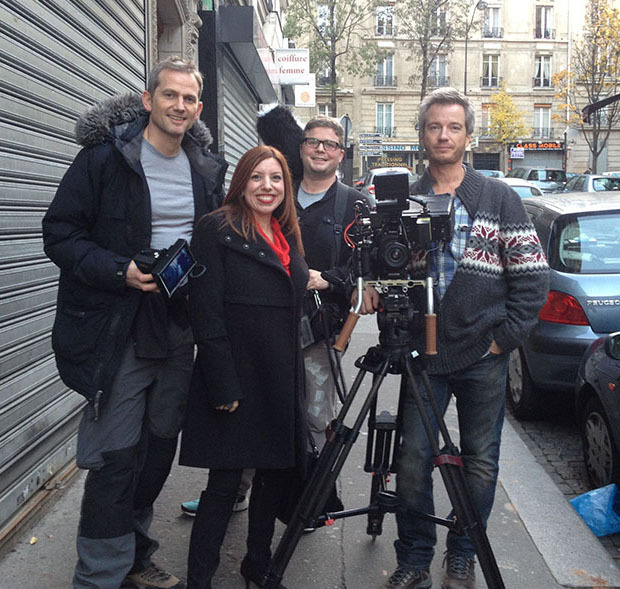 With the crew from London in Montmartre: l to r: Director, David Holroyd; Sound, Joe Saunders; Cameraman, Mike Hodder. Yes, I know, they were super cute. 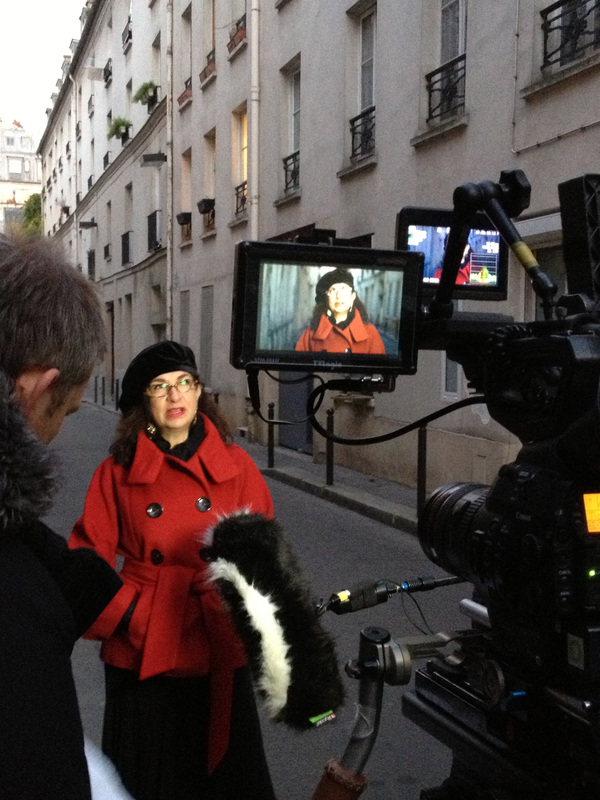 Filming in the 4th arrondissement early morning. It was 0C/32F! Hopefully HGTV Canada will show it soon , love that Paris agent, she’s pretty funny. I’ll ask them about Canada (I also want to ask about the UK). Adrian (Leeds) is great. We’ve become friends. Love her. I wish you could watch it online. Love to see it in Paris. I’ll look for it online if it’s available to purchase as an episode. Thanks! I hear they sell them on iTunes after a while. Where did you get your beautiful coat? I loved you in this HGTV show. I was so excited for you & your new found happiness. Your excitement & enthusiasm overwhelmed me. Although I will probably never get to Paris I truly enjoyed watching as you searched for your new home. Paris truly looks wonderful! I wish you the very best & many happy years in your new surroundings! Thank you so much. It really did change my life! Loved the episode, love Adrian, love the coat, too! Wish you only the best! That Parisian agent is GREAT! And quite entertaining. Great story re: your hunt in the city of lights. Congrats! Anxious to see the episode. Not to get to personal but could you do a brief blog entry related to how you worked to the financing for the purchase? Think your readers might be interested in the challenges and level of complexity involved and how it would differ from purchasing property here in the United States. Also, did Adrienne help you find contractors to help with future renovations? I made a suggestion to House Hunters International that they should do a spin-off series that chronicles the renovation process of these properties. Hello! I’ll answer your questions in reverse: There is already a renovation spin-off of House Hunters: “House Hunters: Renovation” and “House Hunters International: Renovation.” Check the listings on HGTV. Not sure if the international version has launched yet but I know they were filming last year. Expat agents can help you find trust-worthy contractors, architects, even interior designers. They can also help you set up your utilities, arrange for homeowners insurance, etc. It’s for this reason I strongly suggest people use an expat real estate agent vs. going it alone in France. Again, an expat agent would be the best to advise you here and can hold your hand throughout the process—from search, to financing and purchase, to managing the place for you if you need. Thanks so much for such a detailed response. Im a cord cutter so don’t get cable and must watch episodes online or via ITunes so wasn’t aware that there was a House Hunters international renovation series. 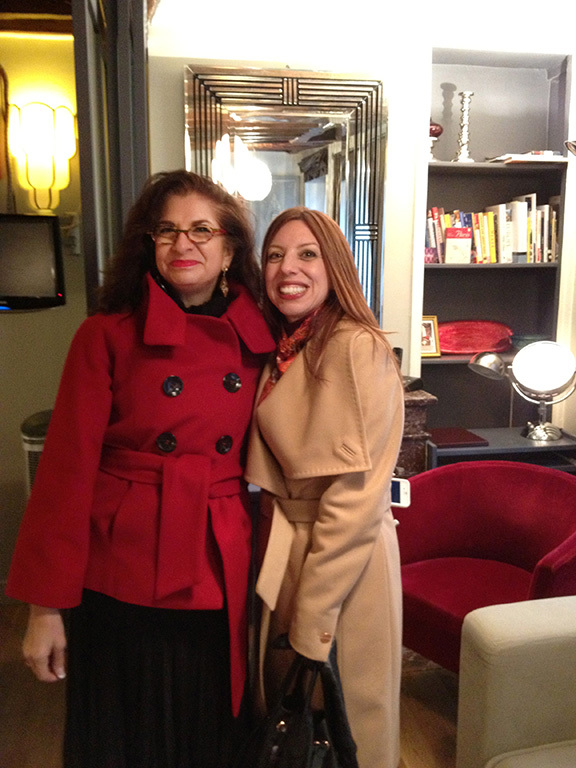 I saw your story on House Hunters International and it was love at first site; but not with Paris but with you. I will continue to read your blog to try and share in your adventures. Have fun and enjoy life. Thank you for this message, Lilly! I’m happy to have inspired you. Welcome to my blog, and I hope to see you here often.